Welcome to the POW! 30-Day Challenge! To get the most out of this fun exercise, all you have to do is set your intention. It can be a goal that you have been dreaming of doing. It can be something you used to do. It can be something you are already doing but want to kick up a notch. And doing it is simple – print out the POW! 30-Day Challenge PDF. Write your goal at the top of the sheet. For every day you accomplish your task, mark a big fat “X” on the calendar. Keep going until you have filled out your 30-Day Challenge worksheet. The only rule – and I urge you to keep it – is that if you miss a day, you have to start over. You see the goal is not just your stated goal. It is to build your Power of Will. The idea that you can set your own intention and use your determination to follow through on your decision. So you see when you have completed the 30-Day Power of Will challenge you will have actually achieved two goals. The first is your stated intention – it can be to exercise for 30 minutes every day. Or to write a blog post every day, for 30 days. Or, to do something to get a new job every single day for those 30 days. When you get to the end of your own challenge you will have achieved your stated goal. You will also have proved it to yourself that you do have substantial Willpower. And you will have strengthened it over the course of your personal challenge. This is why you should start over if you do happen to miss a day – and it really is not that big a deal – missing a day is in itself an education. Sometimes you will realize that you have to do better at managing your time and even cutting out other activities that interfere with your stated goal. This is all good. When you go back to a clean sheet you will be stronger and more determined to complete your own personal 30-Day Challenge. And when you see a completely marked off sheet you will feel even better then if you had done it in a nonconsecutive manner. You can see in the PDF that we have included several sheets and of course you can print out the document several times. 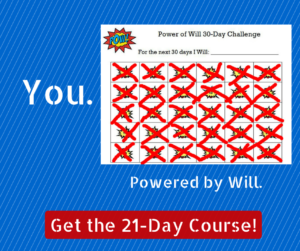 The Power of Will Workbook. 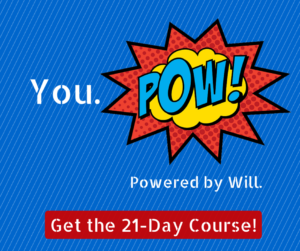 21 Days of Power of Will MP3s.